Great space for this – on the wharf at Walsh Bay. Art and wine. Wine and music. Music and art. All three share synergies, parallels, artistic ideals, the lot. Obviously wine is just a bit more cut and dried than the other two (arguably), yet the commonalities are unmissable (or at least I think so). Given these commonalities then it’s probably quite surprising that we don’t see more art inspired by wine, especially given that the stereotypical artist drinks plenty of the stuff (particularly at gallery openings) and is probably particularly inspired when influenced by wine. Yet we rarely see much in the way of art dedicated to wine. Penfolds, however, have attempted to address that gap with this latest project. 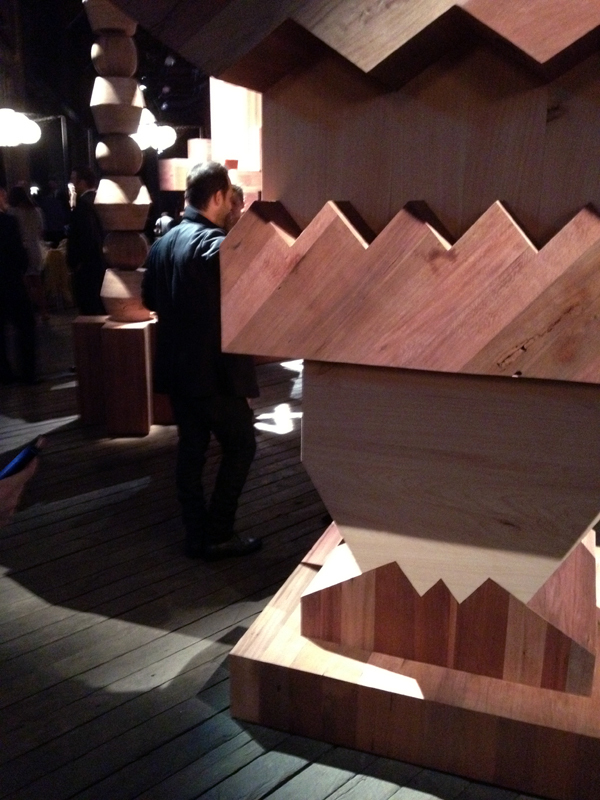 Called ‘The Blocks’, said project is a collaboration between London designers Studio Twogood and Penfolds, with the art-installation-meets-wine-bar-concept focused particularly on a set of large wooden totems – essentially large wooden sculptures – that are then prepared by a perfumer to showcase some of the scents you might find in (Penfolds) wine. That’s someone famous in the background too. The way this ‘multi sensory environment’ then works is that you wander around the exhibit – which is housed in a pretty cool wharf warehouse space in Sydney’s Walsh Bay – accompanied by a ‘sommelier’ who guides you through the art installation with a selection from the Penfolds Bin/Luxury range to taste as you go. You thus enjoy a glass or two of wine, accompanied by a tasting menu prepared by Magill Estate Executive Chef Jock Monfrillo, and spend plenty of time smelling wood and loitering around looking at art. 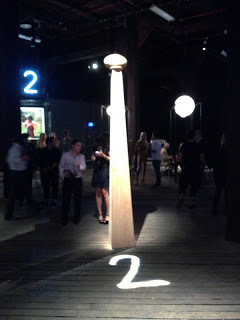 I was one of said loiterers at the launch a week or so ago, largely to see what Penfolds – whom have a history of toying with art and wine – had managed to bring together, but also to see what this intriguing wood scented totems shenanigans was all about. Now I’m the first to admit that I’m not much of an art critic. I like quite my art classical really (with exceptions), so I’m not probably not very well placed to comment on the quality of the works themselves. Moreso, as one of the few ‘wine’ people at the launch party I think I stood out as one of the least arty types there – with my distinct lack of rolled up jeans, boat shoes and carefully coiffed hair (for guys). For girls it was one-piece jumpsuits (which apparently are ‘so hot right now’) and more big hair. Or such. 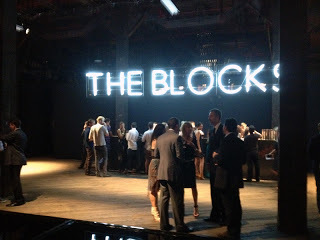 Regardless of such fashion comments, I still liked the exhibtion and thought that the execution was good. The whole operation has an air of professionalism to it, the work clearly created by talented artists. 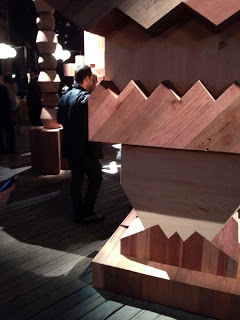 It didn’t move me (the art at least) but I was entertained by attempts to pick up scent ‘interpretations’ from big pieces of wood. Suffice to say that anyone who is used to playing with Le Nuz De Vin or other professional scent kits might be a little baffled too..
As for the wines, there was one particular new release from the Penfolds range that stood out (for me at least). That was the 2010 Penfolds Bin 128 Coonawarra Shiraz, which I think might be the best 128 I’ve seen in years..
What makes the 128 work is all about simplicity – it’s a thoroughly medium bodied Shiraz (as Coonawarra Shiraz should be), with trademark Penfoldian richness but also with a hint of leaf and grainy tannins. Medium weight, understated yet also bold enough to carry the red Penfolds cap. Everything in it’s right place. Perhaps a little bit ‘airbrushed’ but no questioning the appeal. Considering that it’s a relatively affordable part of the Penfolds range, it’s not hard to give it a big thumbs up. I went back for seconds. Another block. A phallic one. On another tack, they were serving a particularly interesting cocktail on the night too (an expensive one to replicate perhaps) that mixed Bombay Sapphire gin, Lillet and Penfolds Grandfather tawny to make a thoroughly boozy, if quite intriguing (the richness of the old fortified worked great against the straight spirits), mixed drink of choice. Liked that too. Seconds again. Besides the drinks (I saw so little food that I can’t comment on what was served. There was ‘things on spoons’) the whole experience then was a good one. The verdict then on ‘The Blocks’ is pretty simple – hardly a serious wine tasting experience, but well worth a look, particularly given that it’s free (to wander around at least). It's free to wander, but $35 for a four wine tasting it seems a bit on the steep side. The food was also quite pricey – enough so that we split without checking it out.